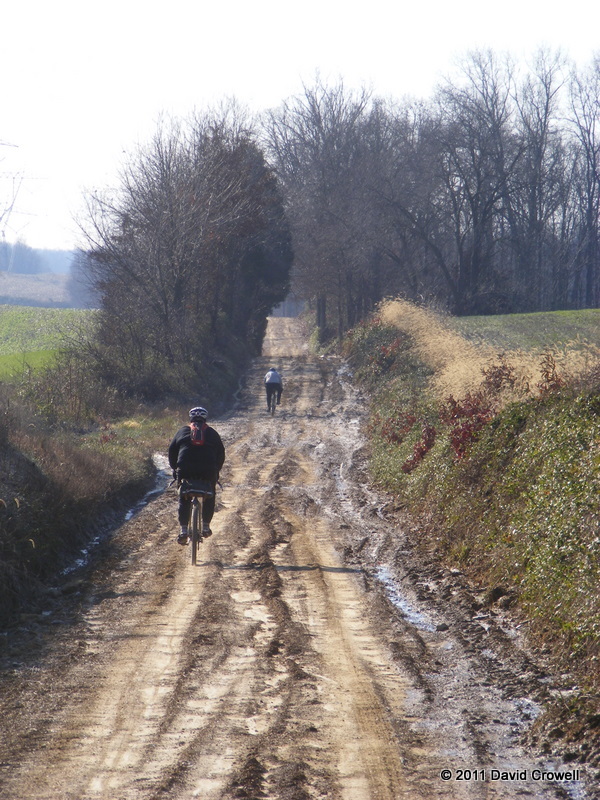 Tim, Patrick, and I got together early this morning for a drive out to Holland Indiana for another gravel ride. We all rode with Tim. Tim picked me up right on time at 6:20. We loaded my bike, and made a stop at Sunergos… which doesn’t open until 7:00 on Sundays now. Okay, next door is Nord’s with passable coffee and a donut. As we left the metro area the temperature dropped from about 22F to 17F. Brrrr. It had warmed to about 19F by the time we arrived in Holland. I have some history with riding in the winter out of Holland. Last time, we had a planned store stop in Winslow, just as we did this time. Last time, we cut that part of the ride out and I stopped and refused to ride farther because the snow was too much for me to ride in. I ended up sitting on a bench in the town of Stendal waiting for a ride back home. Today was cold, but there was no snow. About 7 miles in, we come across our first problem. The route was taking us on a private road with big KEEP OUT signs. We routed around and kept going. I had switched back to clipless pedals recently, and had tried my best to keep my feet warm in the vented shoes. I wore two pair of wool socks with plastic bags between them to block wind and keep warmth in. It really wasn’t working. My feet were getting painfully cold. The rest of me was comfortable. Although he wasn’t complaining about it at the time, Patrick was suffering cold feet also. He was running his normal clipless pedals and shoes with toe covers. Tim was the smart one. He swapped out his pedals for some platforms and wore warm shoes. I had made comments before the ride that “at least were routing around Stendal” – the town I sat on a bench in the cold back in January. Our detour to avoid the private roads took us through Stendal. The bench is still there in front of the defunct Stendal Store. At about mile 17 Tim decided he needed to head back. He was feeling weak and ill. He tried to convince us to continue the ride, since I had my GPS. Patrick and I both had painfully cold feet and we just figured that left us more time to eat. We headed back a mostly direct route to Holland, passing through Stendal once again. Nearly back to Holland we turned south on S 825 W. This road surface was incredibly bad. Luckily it was frozen enough that we didn’t bog down in mud. We rolled back to Tim’s car. Tim was glad to be off the bike, and could barely walk. Patrick and I were griping about our frozen toes. We loaded the bikes and stopped at Waffle House for a completely unhealthy, yet totally satisfying meal. The planned 55-mile ride turned out to be only 27.5 miles. It was still a much more enjoyable day than hanging around the house, or even riding around town. Still bummed to have cut your ride short, but very happy with my own decision. I’m low from something. Hopefully it will pass soon. As for Stendal, be wary. I’m glad you guys got out for a ride. Honestly 27 miles sounds like enough, in those conditions. S 825 W looks nasty in your photo … just wow! I’m with Michael — 27 miles in those conditions is pretty darned good, if you ask me! S825W looks positively medieval. You guys always amaze me. Bravo on getting out there in what I call stare at the fireplace conditions. Asher, That road was mostly frozen, so not too bad. It was actually fun. Great looking ride. Anymore, I ride in big hiking boots when the temp drops below 20. I’d love to have nicer winter clipless boots. But my everyday Asolo hiking boots keep me plenty warm with one pair of wool socks. Wrapping your feet in mylar works, too. After getting the gear right, I love riding in cold weather. It just takes me a while to figure it out every year. I have nice warm hiking boots that are perfect. I used them last winter. I’ve just been too stubborn to wear them on a bike ride. I will next time.